Rodriguez, J.; Culver, D. B.; Conley, M. P. Generation of Phosphonium Sites on Sulfated Zirconium Oxide: Relationship to Brønsted Acid Strength of Surface –OH Sites. J. Am. Chem. Soc. In Press, DOI: 10.1021/jacs.8b13204. Gordon, C. P.; Culver, D. B.; Conley, M. P.; Eisenstein, O.; Andersen, R. A.; Copéret, C. pi-Bond Character in Metal-Alkyl Compounds for C-H Activation: How, When, and Why? J. Am. Chem. Soc. 2019, 141, 648-656. Culver, D. B.; Conley, M. P. Activation of C–F Bonds by Electrophilic Organosilicon Sites Supported on Sulfated Zirconia. Angew. Chem. Int. Ed. 2018, 130, 15118-15121. Huynh, W.; Culver, D. B.; Tafazolian, H.; Conley, M. P. Solid-state 45Sc NMR of Cp*2Sc–X and Cp*2ScX(THF). Dalton Trans. 2018, 47, 13063 - 13071. Culver, D. B.; Huynh, W.; Tafazolian, H.; Ong, T. C.; Conley, M. P. The Beta-Agostic Structure in (C5Me5)2ScCH2CH3: Solid-State NMR Studies of (C5Me5)2Sc–R (R = Me, Ph, Et). Angew. Chem. Int. Ed. 2018, 57, 9250-9253. Culver, D. B.; Tafazolian, H.; Conley, M. P. A Bulky Pd(II) α-Diimine Catalyst Supported on Sulfated Zirconia for the Polymerization of Ethylene and Copolymerization of Ethylene and Methyl Acrylate. Organometallics, 2018, 1001-1006. Tafazolian, H.; Culver, D. B.; Conley, M. P. A Well-Defined Ni(II) α-Diimine Catalyst Supported on Sulfated Zirconia for Polymerization Catalysis. Organometallics 2017, 36, 2385-2388. 33.) Copéret, C.; Allouche, F.; Chang,K. ; Conley, M. P.; Delley, M. F.; Fedorov, A.; Moroz, I.; Mougel, V.; Pucino, M.; Searles, K.; Yamamoto, K.; Zhizhko, P. Bridging the Gap Between Industrial and Well-Defined Supported Catalysts. Angew. Chem. Int. Ed. 2017, 57​, 6398-6440. 32.) Berruyer, P.; Moreno, L.; Conley, M. P.; Silvero, D. L.; Widdifield, C. M.; Siddiqi, G.; Gajan, D.; Lesage, A.; Copéret, C.; Emsley, L. Three-Dimensional Structure Determination of Surface Sites. J. Am. Chem. Soc. 2017, 139, 849 – 855. 31.) Valla, M.; Wischert, R.; Comas-Vives, A.; Conley, M. P.; Verel, R.; Copéret, C.; Sautet, P. Role of Tri-coordinate Al Sites in CH3ReO3 Olefin Metathesis Catalysts. J. Am. Chem. Soc. 2016, 138, 6774 – 6785. 30.) Conley, M. P.; Lapadula, G.; Sanders, K.; Gajan, D.; Lesage, A.; Rosal, I.; Maron, L.; Lukens, W. W.; Copéret, C.; Andersen, R. A.The Nature of Secondary Interactions at Electrophilic Metal Sites of Molecular and Silica-supported Organolutetium Complexes from Solid-State NMR Spectroscopy. J. Am. Chem. Soc. 2016, 138, 3831 – 3843. 29.) 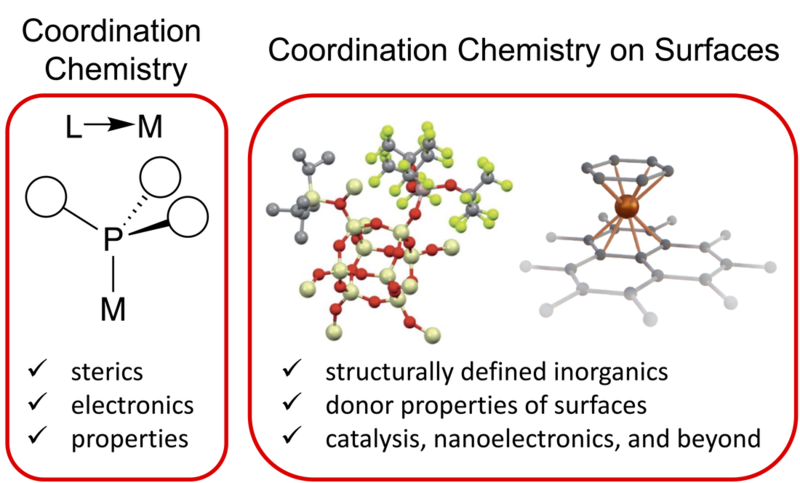 Copéret, C.; Comas-Vives, A.; Conley, M. P.; Estes, D.; Nunez-Zarur, F.; Fedorov, A.; Mougel, V.; Nagae, H.; Zhizhko, P.: Surface Organometallic and Coordination Chemistry towards Single-Site Heterogeneous Catalysts: Strategies, Methods, Structures, and Activities. Chem. Rev. 2016, 116, 323 – 421. 28.) Lapadula, G.; Conley, M. P.; Copéret, C.; Andersen, R. A.: Synthesis and Characterization of Rare Earth Siloxide Complexes, M[OSi(OtBu)3]­3(L)x where L is HOSi(OtBu)3 and x=0 or 1. Organometallics, 2016, 34, 2271 – 2277. 27.) Conley, M. P.; Delley, M. F.; Nunez-Zarur, F.; Comas-Vives, A.; Copéret, C.: Heterolytic Activation of C–H Bonds on CrIII–O Surface Sites Is a Key Step in Catalytic Polymerization of Ethylene and Dehydrogenation of Propane. Inorg. Chem., 2015, 54, 5065–5078. 26.) Lapadula, G.; Trummer, D.; Conley, M.P. ; Steinmann, M.: Ran, Ying-Fen; Brasselet, S.; Guyot, Y.; Maury, O.; Decurtins, S.; Liu, Shi-Xia; Copéret, C.: One-Photon Near-Infrared Sensitization of Well-Defined Yb(III) Surface Complexes for NIR-to-NIR Single Nanoparticle Imaging. Chem. Mat. 2015, 27, 2033–2039. 25.) Valla, M.; Conley, M. P.; Copéret, C.: MeReO3/Al2O3 and Me4Sn Activated Re2O7/Al2O3 Alkene Metathesis Catalysts have Similar Active Sites. Catal. Sci. Tech., 2015, 5, 1438–1442. 24.) Gajan, D.; Bornet, A.; Vuichoudb, B.; Milanib, J.; Melzic, R.; Veyre, L.; Thieuleux, C.; Conley, M. P.; Grüning, W. R.; Schwarzwälder, M.; Lesage, A.; Copéret, C.; Bodenhausen, G.; Emsley, L.; Jannin, S.: Hybrid Polarizing Solids for Pure Hyperpolarized Liquids through Dissolution Dynamic Nuclear Polarization. Proc. Nat. Acad. Sci. USA, 2014, 111, 14693–14697. 23.) Conley, M. P.; Forrest, W. P.; Mougel, V.; Copéret, C.; Schrock, R. R.: A Bulky Aryloxide Ligand Stabilizes a Heterogeneous Metathesis Catalyst. Angew. Chem. Int. Ed., 2014, 53, 14221–14224. 22.) Feng, G; Conley, M. P.; Jordan, R. F.: Differentiation between Chelate Ring Inversion and Aryl Rotation in a CF3-Substituted Phosphine-Sulfonate Palladium Methyl Complex. Organometallics, 2014, 33, 4486–4496. 21.) Filoneko, G. A.; Cosimi, E.; Lefort, L.; Conley, M. P.; Copéret, C.; Lutz, M.; Hensen, E. J. M.; Pidko, E. A.: Lutidine Derived Ru-CNC Hydrogenation Pincer Catalysts with Versatile Coordination Properties. ACS Catal. 2014, 4, 2667–2671. 20.) Delley, M. F.; Núñez-Zarur, F.; Conley, M. P.; Comas-Vives, A.; Siddiqi, G.; Norsic, S.; Monteil, V.; Safonova, O. V.; Christophe Copéret, C.: Proton Transfers Are Key Elementary Steps in Ethylene Polymerization on Isolated Chromium(III) Silicates. Proc. Nat. Acad. Sci. USA, 2014, 112, 11629-11629. See commentary by K. Theopold, Proc. Nat. Acad. Sci. USA, 2014, 112, 11578-11579. 19.) Conley, M. P.; Rossini, A. J.; Comas Vives, A.; Valla, M.; Ouari, O.; Tordo, P.; Lesage, A.; Emsley, L.; Copéret, C.: Evidence for Surface rearrangement involving Q2-sites and strained siloxane bridges from 119Sn Surface Enhanced NMR Spectroscopy. Phys. Chem. Chem. Phys. 2014, 16, 17822-17827. 18.) Conley, M. P.; Copéret, C.; Thieuleux, C.: Mesostructured Hybrid Organic Silica Materials: Well-defined and regularly distributed supported Catalysts into the channel pores of a silica matrix. ACS Catal. 2014, 4, 1458-1469. 17.) Delley, M. F.; Conley, M. P.; Copéret, C.: Polymerization on CO-Reduced Phillips Catalyst initiates through the C-H bond activation of ethylene on Cr–O sites. Catal. Lett. 2014, 144, 805-888. 16.) Kermagoret, A.; Kerber, R. N.; Conley, M. P.; Callens, E.; Florian, P.; Massiot, D.; Copéret, C.; Delbecq, F.; Rozanska, X.; Sautet, P.: Chloroalkylaluminum supported on silica: a dinuclear aluminum surface species with bridging μ2–Cl–ligand for a highly efficient co-catalyst for the Ni-catalyzed dimerization of ethene. J. Catal. 2014, 313, 46-54. 14.) Conley, M. P.; Delley, M. F.; Siddiqui, G.; Lapadula, G.; Norsic, S.; Monteil, V.; Safonova, O. V.; Copéret, C.: Polymerization of Ethylene by Silica-Supported Dinuclear CrIII Sites through an Initiation Step Involving C-H Bond Activation. Angew. Chem. Int. Ed. 2014, 53, 1872-1876. 13.) Lapadula, G.; Bourdolle, A.; Allouche, F.; Conley, M.P. ; del Rosal, I.; Maron, L.; Lukens, W. W.; Guyot, Y.; Andraud, C.; Brasselet, S.; Copéret, C.; Maury, O.; Andersen, R. A.: Near-IR Two-photon Microscopy Imaging of Nanoparticles Prepared by Controlled Functionalization of Silica with 4,4’diethylaminostyryl-2,2’bipyridine Yb(III) Surface Sites. Chem. Mat. 2014, 26, 1062-1073. 12.) Conley, M. P.; Mougel, V.; Peryshkov, D. V.; Forrest, W. F.; Gajan, D.; Lesage, A.; Emsley, L.; Copéret, C.; Schrock, R. R.: A well-defined silica-supported tungsten oxo alkylidene as a highly active alkene metathesis catalyst. J. Am. Chem. Soc. 2013, 135, 19068-19070. 11.) Filonenko, G. A.; Conley, M. P.; Copéret, C.; Lutz, M.; Hensen, E. J. M.; Pidko, E. A.: The Impact of Metal-ligand Cooperation in Hydrogenation of Carbon Dioxide Catalyzed by a Ruthenium PNP Pincer. ACS Catal. 2013, 3, 2522-2526. 10.) Gajan, D.; Schwarzwälder, M.; Conley, M. P.; Gruening, W. R.; Rossini, A. J.; Zagdoun, A.; Lelli, M.; Yulikov, M.; Jeschke, G.; Sauvée, C.; Ouari, O.; Tordo, P.; Veyre, L.; Lesage, A.; Thieuleux, C.; Emsley, L.; Copéret, C.: Solid-phase DNP Polarizing Matrices from Homogeneously Distributed Radicals in Mesostructured Hybrid Silica Materials. J. Am. Chem. Soc. 2013, 135, 15459-15466. 9.) Conley, M. P.; Drost, R. M.; Baffert, M.; Gajan, D.; Elsevier, C.; Franks, W. T.; Oschkinat, H.; Veyre, L.; Zagdoun, A.; Rossini, A.; Lelli, M.; Lesage, A.; Casano, G.; Ouari, O.; Tordo, P.; Emsley, L.; Copéret, C.; Thieuleux, C.: A Well-Defined Pd Hybrid Material for the Z-Selective Semi-hydrogenation of Alkynes Characterized at the Molecular Level by DNP SENS. Chem. Eur. J. 2013, 19, 12234-12238. 8.) Kermagoret, A.; Kerber, R. N.; Conley, M. P.; Callens, E.; Florian, P.; Massiot, D.; Copéret, C.; Delbecq, F.; Rozanska, X.; Sautet, P.: Triisobutylaluminum: Bulkier and Yet More Reactive Towards Silica Surfaces than Triethyl or Trimethylaluminum. Dalton Trans. 2013, 42, 12681-12687. 7.) Zagdoun, A.; Rossini, A. J.; Conley, M. P.; Grüning, W. R.; Schwarzwälder, M.; Lelli, M.; Franks, W. T.; Oschkinat, H.; Copéret, C.; Emsley, L.; Lesage, A.: Improved Dynamic Nuclear Polarization Surface-Enhanced NMR Spectroscopy through Controlled Incorporation of Deuterated Functional Groups. Angew. Chem. Int. Ed. 2013, 52, 1222-1225. 6.) Conley, M. P.; Copéret , C.: Solid-state NMR: An EYE Opener in Surface Chemistry. CHIMIA. 2012, 66, 752-758. 5.) Conley, M. P.; Valero, J.; de Mendoza, J. Guanidinium Based Receptors for Oxoanions. In Supramolecular Chemistry: From Molecules to Nanomaterials; Gale, P. A. Ed; Wiley-VCH: New York, 2012. 4.) Conley, M. P.; Jordan, R. F.: Cis/trans Isomerization of Phosphinesulfonate Palladium(II) Complexes. Angew. Chem. Int. Ed. 2011, 50, 3744-3746. 3.) Conley, M. P.; Burns, C. T.; Jordan, R. F.: Mechanism of Ethylene Oligomerization by a Cationic Palladium(II) Alkyl Complex that Contains a (3,5-Me2-pyrazolyl)2CHSi(p-tolyl)3) Ligand. Organometallics 2007, 26, 6750-6759. 2.) Sun, J.; Conley, M. P.; Zhang, L.; Kozmin, S. A.: Au- and Pt-Catalyzed Cycloisomerizations of 1,5-Enynes to Cyclohexadienes with a Broad Alkyne Scope. J. Am. Chem. Soc. 2006, 128, 9705-9710. 1.) Rubina, M.; Conley, M. P.; Gevorgyan, V.: Dramatic Acceleration of the Pd-Catalyzed [4+2] Benzannulation Reaction of Enynes and Diynes in the Presence of Lewis Acids and Bases: Expanded Scope and New Mechanistic Insights. J. Am. Chem. Soc. 2006, 128, 5818-5827.